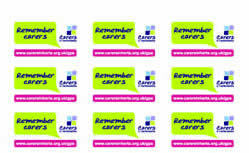 Self referral formWe want to work with you to help you identify and support carers in your surgery. You can download any of the materials below free of charge and use them in your surgery. 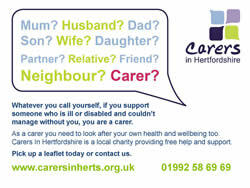 If you would like multiple copies to distribute to carers, or if there is any other information that would be useful to you, please let us know. 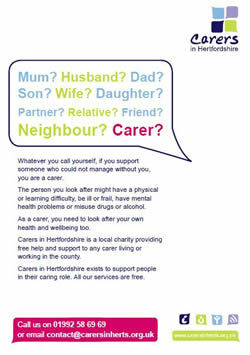 A leaflet for carers, which you can distribute or leave in your waiting room, where carers can find out about the support we offer them, and can refer themselves to us. 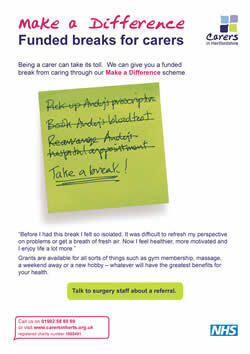 A poster for you to display in your waiting room, explaining our Make a Difference scheme, offering funded breaks for carers. A powerpoint slide with our key information, which you can display on a screen in your waiting room. If you would prefer this in another format, please let us know. 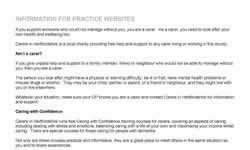 Information about our services for you to upload to your practice website so that carers can find out about our support. 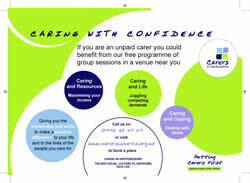 A poster for you to display in your waiting room, to encourage young carers to recognise their caring role. 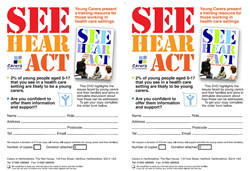 Order your copy of the training DVD for health professionals about supporting young carers in healthcare settings. 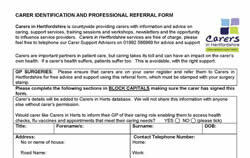 A referral form to Carers in Hertfordshire for GP surgeries. 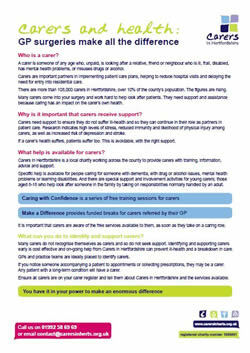 A simple, concise outline for surgery staff, explaining who carers are, why they need support, the support available and what you can do to help. 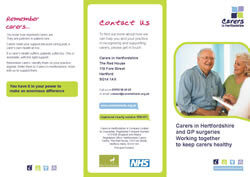 A leaflet for surgery staff explaining our work and how we can work with you to support carers in your surgery. A template for stickers with our website address. 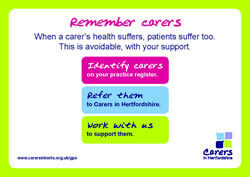 A postcard for surgery staff to keep handy, reminding them to support carers and with our key details. 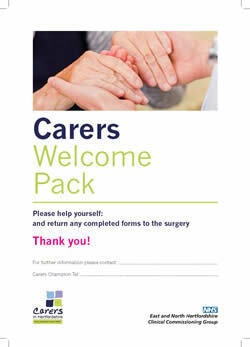 A welcome pack for you to personalise for your surgery and give to carers when they register.